I have a splitting headache this week, so I can't think of a good topic to talk about. Actually, for those of you still reading this blog (assuming there are still readers on this blog), why not use this opportunity to suggest some topics for me to talk about next time? With that said, I leave you with this week's fanart. See you next week! Spoiled, selfish, jealous, clingy, annoying, useless... these are just some of the many negative adjectives which Nagi has been described as in the series -- and undeniably, they are/were true to some extent. 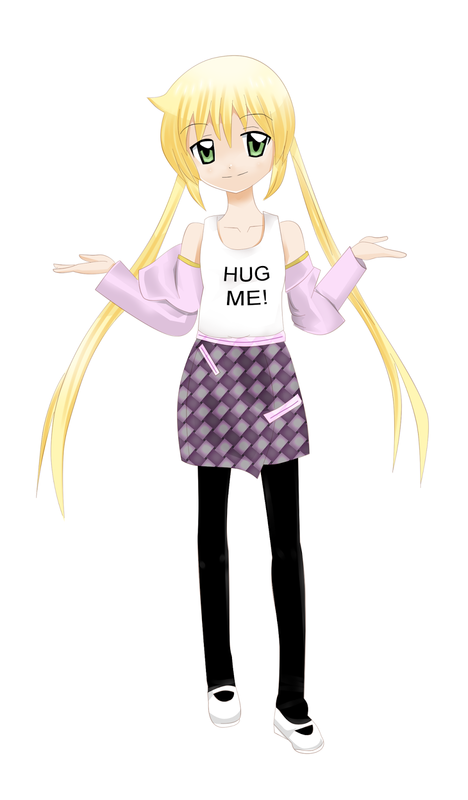 So this week, someone asked me the question: If you had a girlfriend like Nagi, how would you handle her? Fortunately, the answer is pretty short and straightforward: Quite easily. This is because while Nagi has several negative characteristics, she is actually rather easy to handle as a person. All you really need to do is to reassure her that you do indeed love her and simply put, don't give her a reason to be insecure about your feelings for her. Yes, she can be jealous, clingy, possessive, and everything in-between, but I don't really count these as points against her. It just really goes to show much she values the person she loves -- and it's not like her feelings remain static throughout the series. This is something that is oft-ignored when people do an analysis of Nagi's personality. 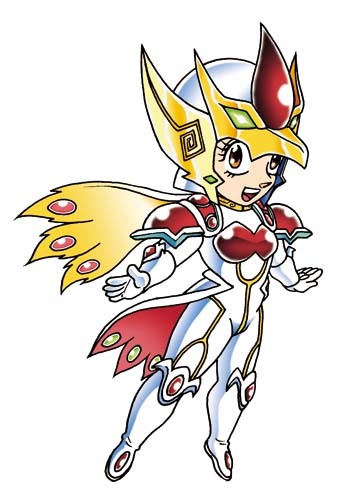 They tend to view her as a static character who can only be judged through her outward, tsundere traits. Nagi goes on several jealous streaks throughout the series regarding Hayate and his easily misunderstood encounters with the other girls -- but in most of these cases, her jealousy is actually justified. You have to look at things from her perspective. 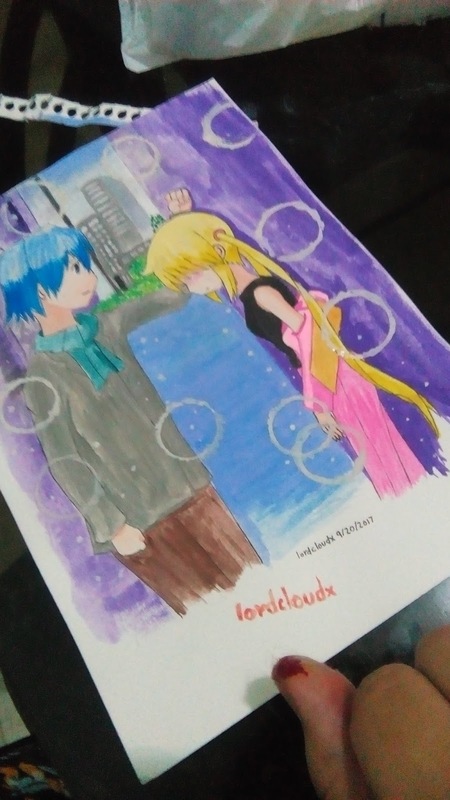 In her belief, Hayate is her boyfriend and is madly in love with her -- therefore, what business does he have casually flirting with other girls -- or at least doing things that could be easily misunderstood as flirting when interacting with cute girls in general? And yet, (as I've mentioned several times before) Nagi gradually grows out of her extremely jealous, clingy, possessive, tsundere self eventually. 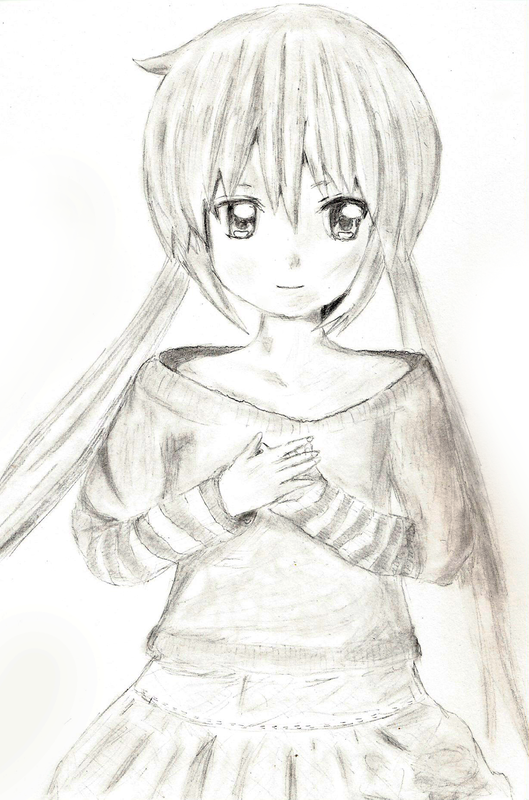 Her love for Hayate matures beautifully as the manga progresses and she passes the ultimate test at 14 years old when after showing several moments of weakness and the even regressing to her needy, clingy side, she overcomes her selfishness and finally makes the ultimate sacrifice -- which ironically also causes Hayate to finally realize his own love for he: she lets him go as her butler and as her prospective lover so that she can grow and become her own person. In any case, Hayate was really largely to blame for a lot of Nagi's insecurities and her jealous and sometimes violent streaks (though not so often). We could justify that he's very dense so he never knew, but don't pin the blame on Nagi for that (that's victim blaming). As Nagi would say, "I'm not the one who started all this. He did." Therefore, if I had a girlfriend like Nagi -- I would cherish her and never really give her a reason to be jealous. If she does get jealous and gets angry with me for some petty reason, then I would do my best to reassure her of my love for her. In short, I wouldn't be the oblivious guy causing all the misunderstandings in the first place. Certainly, I'm not sure if it would work out, but at the very least, I believe in keeping the girl I love happy. Isn't that what really counts? For today's fanart corner, we have a painting signed in blood. It's the good old (new?) kabedon meme. As for signing it in blood -- it's a pretty funny story, really. I'd just finished this painting and then I was getting ready to frame it up. I had to cut off some of the edges to make it fit the frame and I accidentally sliced my thumb open with a box cutter. As I was nursing my wound, my mother suddenly said, "sign it with your blood." 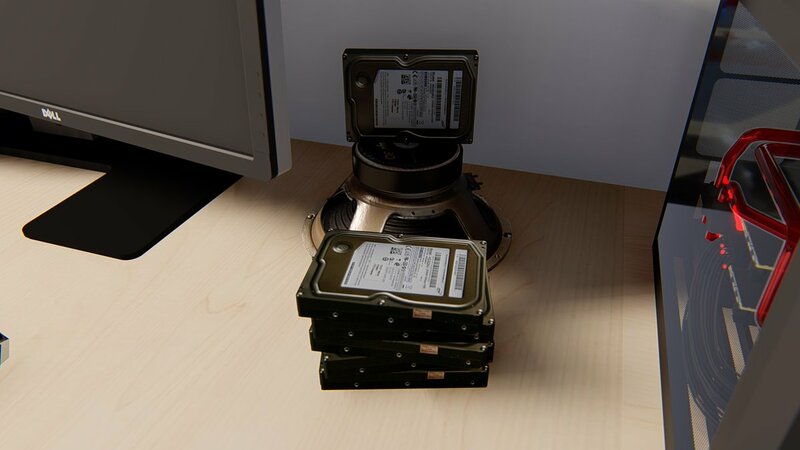 So I was like, "GREAT IDEA!" So I took out a 00 brush and signed this thing with my blood. With that said, I'm pretty happy with how this image turned out with or without the blood signature. 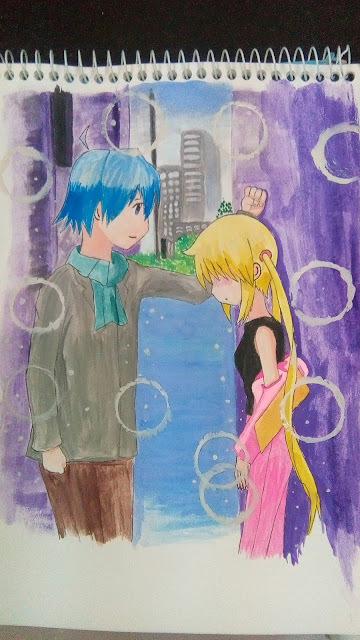 This is watercolors on paper for those who are curious. Just in case you thought I was lying about using my own blood to paint. "There are two kinds of writers. The people who write, and the people who only write about writing." Ponder this statement as you read this blog post. 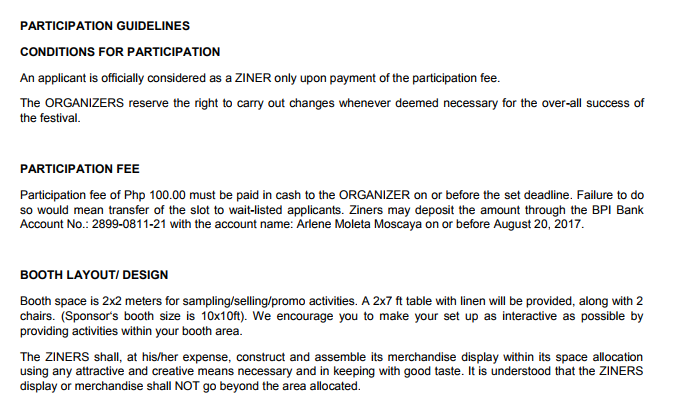 Last August 26-27, I participated in a local comiket-like event called ZineZoned: Iloilo ZineFest. As far as I know, the main focus of the event is to empower writers of all levels to write by providing them with a venue to self-publish and showcase their short literary works in small books/booklets called zines. 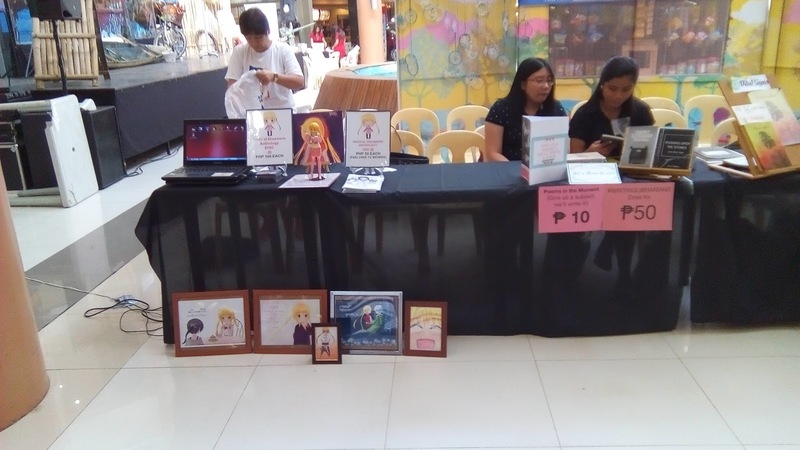 Published authors from Iloilo City may also sell their actual books. The environment is pretty much like comiket really, because you can sell just about any creative work that you want to in your booth including framed artworks and art prints, and even software -- which is what I did. On day one, there were several hitches which almost made me quit. 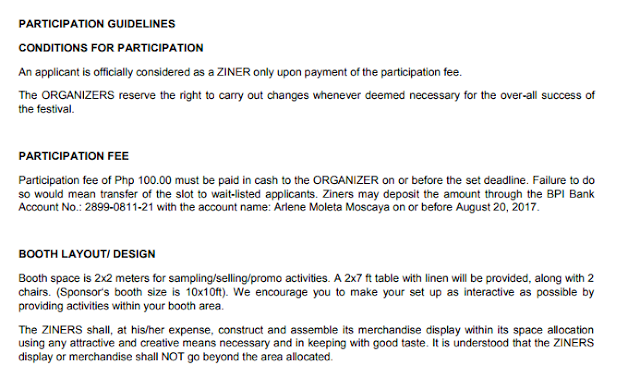 First of all, here are the guidelines for the event. So I think it's pretty clear here that the booth space should be 2x2 meters and that a 2x7 ft. table would be provided. Anyway, upon arrival, I discovered that the table was actually two 1x2 tables put together, or a total space of 2x4 meters, now this was mostly fine, but here's the clincher: the booth space would have to be shared by 4 participants. That means we'd be crammed into a 2x4 booth space. So that leaves just one meter lengthwise of space for a single participant. Well... the problem is that I brought a lot of stuff to display. Fortunately, we brought my own table to the event -- which was allowed. This wasn't the only problem, however. You see, I had planned to sell an installer disc with 8 of my visual novels included. I burned 20 mini-discs for this purpose selling them for a hundred pesos each ($2.00) along with my zine (which contains some of my very short stories ) for 50 pesos each ($1.00). In order to show prospective buyers what my visual novels were all about, I set up my laptop with a desktop launcher that would allow them to browse and try out my VNs before they buy. Also, as a bonus for buying either the Zine or the Installer disc, I offered a free installation on android phones (via sideload or email) of my visual novel on Google Play: "A Million Promises." So I paid for two days of electricity, but then there were problems because there was no power outlet near my booth. It took about an hour for the managers of the event to provide for electricity and by then, my laptop (which is old) had almost run out of power. Although the problem was eventually resolved, I had to buy my own extension cord from the hardware store in the mall so that the mall's engineers could use it to extend their line to my laptop. Now I'm not sure... maybe this is what happens when you deal with "real people," because someone apparently has this notion that because I write in fantasy that I don't deal with "real people," but I hope you'll forgive my delusions if I think that the way this situation was handled gave me the impression that these were real unprofessional "real people." At this point, I was just about ready to give up and leave the event but then... someone came along and browsed my zine. I told her about the phone app offer and showed her what A Million Promises looks like via my laptop -- and I got my first sale. Oh, and I also offered a free quick sketch with each sale. Anyway, my first customer was someone nicknamed Pirin and she asked me to draw her original character from her webcomic. I distinctly remember that she said it was Athena and she looked a bit like Makise Kurisu from Steins;Gate except with grey eyes and hoplite's helmet. I got asked to draw quite a few things along the way, such as Ponyo from some Studio Ghibli anime and Louise from Zero no Tsukaima. After my first sale, I decided that this event wouldn't be so bad after all... and actually, I'm glad I stuck it out. Over-all, I sold 16/18 CDs and 16/20 Zines and several art prints. Not a sell-out, but considering that the buyers were mostly total strangers, I was very happy with my products' performances. 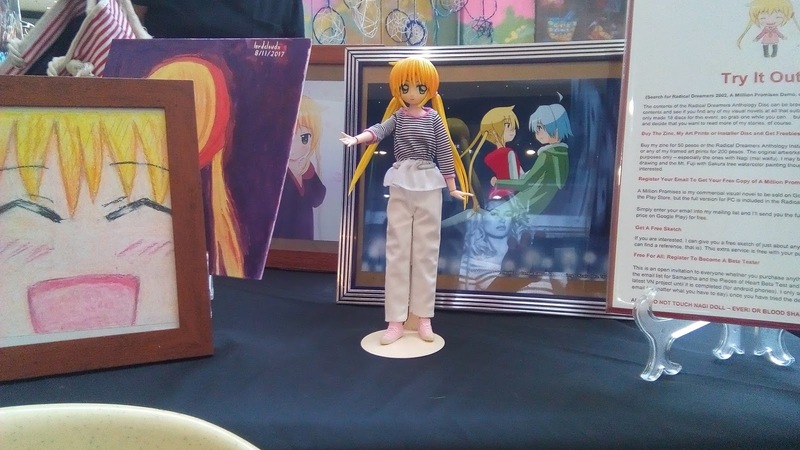 First of all, I brought Nagi doll along and some kid couldn't resist clawing at her. As a result, I wrote this little poem. 2. Someone likes my art! One of the people browsing my booth on Day 1 was a member of the Iloilo Comic Con group. 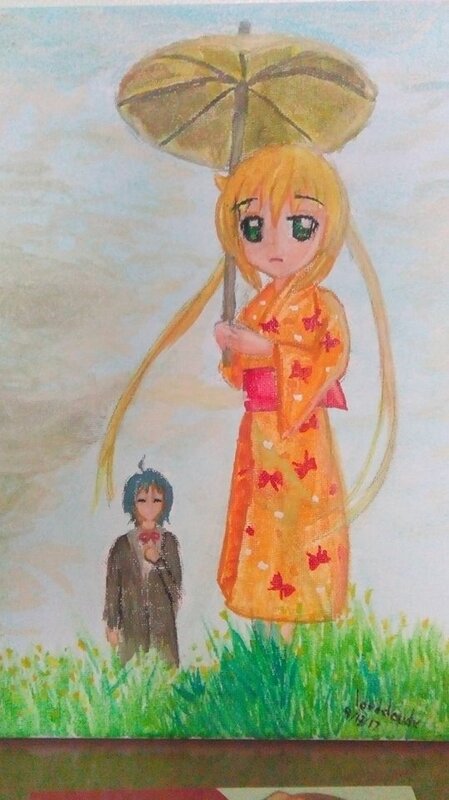 Anyway, he was super interested in this one painting of Nagi that I did. He told me to set a price because he wanted to buy it. 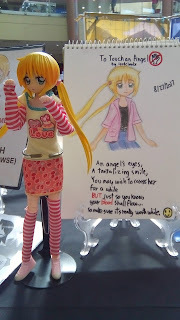 The thing is, I'll never sell any of my manually painted Nagi artworks... ever! 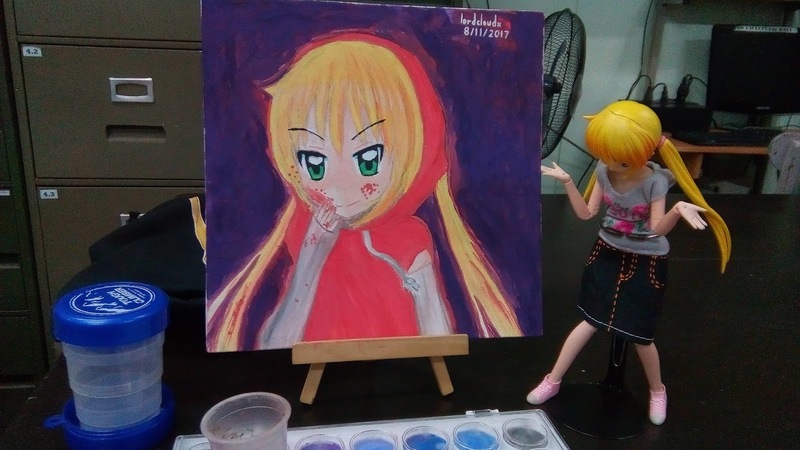 It's not that I think that highly of my art -- it's just that I will never forgive myself if I sell a painting that I worked so hard on and the subject of that painting was Nagi. I love her that much, you see. So it turns out that one of the main reasons why he wanted that painting so much is because his birthday actually falls on the date that I completed the painting... wow! Still, I ain't selling this one! An art print is fine, but there's no way I'm parting with the original. On day 2, just as I was preparing to leave because I'd just about sold out and I was a bit tired, there was an unexpected little guest. It was a little girl that I'd pegged to be about 7-8 years old who was together with her grandparent. At first, I thought that she was too young for any of my stories, but I showed her Samantha and the Pieces of a Heart on my laptop. Her grandmother said that she was actually 10 years old and I was like, "Oh, that's fine then. She might enjoy this story." Anyway, she started reading most of chapter 1 of the story and I saw her eyes light up and I also saw her give a little smile and a slight giggle every now and then. She said she really liked the story, so her grandmother bought the zine and I installed the app on her phone. 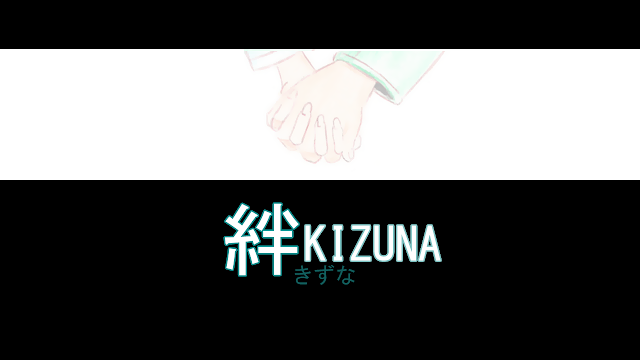 I made it clear that this VN was still a demo version, but that I'd definitely send the full version for free once it was completed. Of course, I've finally made good on that promise. Anyway, here is a message from my little fan on facebook. From the bottom of my heart, even if I had received just a single comment like this one for the entire event -- it would have been all worth it. Of course, not everything about the event itself was good. For one, there was definitely a whole lot of prejudice regarding my works -- especially from older individuals. There were a few friends of my mother's who stopped by the booth. Many of them responded to my works with "oh... anime..." without even actually browsing the zine or any of my visual novels on my laptop. 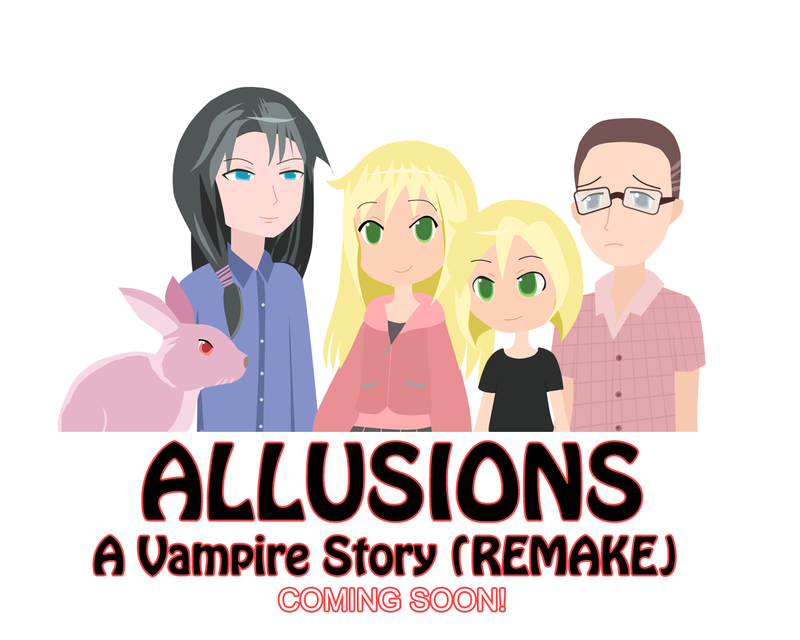 It's as if the cover and in-story illustrations being done in "anime style" just instantly flipped a switch in their brains that I dunno... my works are derivative, mediocre, lacking in depth? I'm not sure what they were thinking, but I am pretty sure the art itself just chased them away from my booth and in a hurry. Seriously, and I'm sure one of those people was a high brow, literary figure in the local circles -- in short, a celebrated writer who might have won a Palanca award or two or whatever. 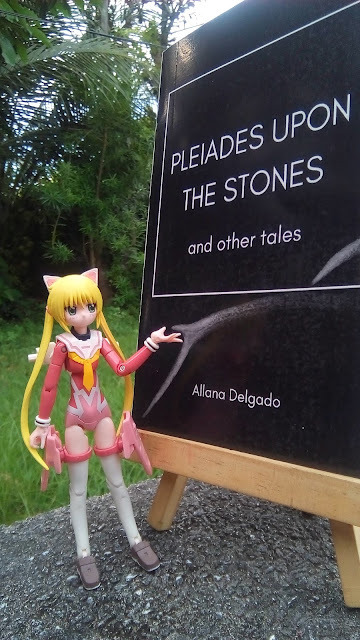 Well, although it is a bit frustrating, I suppose my works were never really meant for such prejudiced individuals in the first place -- so it's not such a bad thing after all. I did make sure to point out this perceived prejudice when it was my time to speak up on stage though. Seriously, I would think that award-winning writers and critics would be well beyond judging a book by its cover, but apparently not. I'm not generalizing here, but if I saw the same reaction 6/8 times, then I think I'm rather justified in feeling there must be some sort of consensus. It's really sad that this prejudice exists within the local writer's circles, which by itself is already a niche kept alive by writers buying other writer's publications. 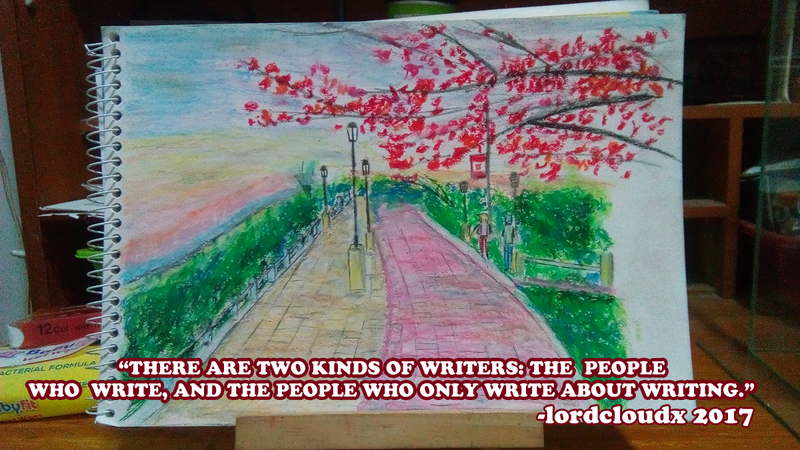 Just because my art looks different from what people are used to, they've already established a preconceived concept in their heads about my depth as a writer. At least give my stories a chance to prove themselves, eh? The event was noisy -- far too noisy to be conducive for interacting with prospective readers. Now I'm fine with a little mood music as well as the speeches by the guest lectureres and some live performances by some extremely skilled musicians/national artists -- however, what really annoyed me is that they hired some barker/emcee/host to remind everyone in the mall in a loud, booming voice about what the zinezoned event was all about like every 10 minutes. This, along with the blaring music in-between the barking made it almost impossible to communicate orally with the prospective buyers. I had to resort to showing them a document with my sales pitch contained inside just to tell them that they would be getting just more than a zine if they bought from me. Of course, do not let my complaints mislead you. I am a person who will honestly complain and point out the negatives in something, but that doesn't mean I disliked the event. In fact, I would say that it was a great experience over-all because I got my stories out to a few people who genuinely bought my stuff based on what they saw at the event... this was really all I was after with this event and on this simple, selfish wish of mine, it has certainly delivered. If you are interested in reading my story, Samantha and the Pieces of a Heart, do give it a download on Google Play. Click on the button to get to the download page. ($2.99). For more info on the app, click here.